The New Year ushers a new beginning for everyone. As a year ends, it also feels like it ends one chapter in a person's life. Since the New Year is all about new beginnings, I have come to realize that it does not matter who you are and what you are. At some point, we all want the same things. Looking at the posts of many, if not all, of my friends on their social media accounts, I constantly see their wishes for 2015. Comparing them, I noticed the similarities. The obvious wishes include the following: To get rich or to be richer, to the loveless, to find a partner, for career and goal-oriented people, it is to get promoted, for the capricious, to be able to buy new gadgets, a car, a house or others things which will make them happy, for married couples who have been trying to conceive, their wish is to have a child, for those who have gained weight or are already plus size, to lose weight, for those who have vices or bad habits, wishing to be rid of them or to at least be able to resist them and lastly, the most obvious and less selfish of all wishes to have good health. We all wish for so many things. Call them New Year's Resolutions if you wish however, they are still expectations, no matter how you look at them. Wishes which are not commonly uttered by many include: World Peace. It might be something that most beauty pageant contestants say but in reality, it is not exactly easily attainable. No matter how we try to achieve it, there can only be a period of peace and it does not last forever. There should be a balance after all and a little chaos mixed to peace is healthy. A cure for deadly disease. Developing one is not easy. Although many say there are already cures readily available to all of us, I believe we should not believe in tall stories. Wishing for the medical field to actually get serious with this and look for cures could take years, even decades, to actually be successful. But that does not mean we should not wish them. Most wishes for the New Year are made for us, not for others. We rarely wish for other people. Sometimes even never. If I am going to be asked how I want my 2015 to be, I would say I don't know. I want so many things, true. However, I also know that reality has other plans and that God will lead us where he wants us to. I would probably wish for our businesses (if not all) will succeed. I am sure that everyone in our family would benefit from this wish. For this year, my husband and I are business and career-oriented thus, the said wish. But we also wish for good health and more patience. Despite the fact that many people around us constantly bug us to include in our priorities having a child, we just don't see that happening this year. This is our way of not being selfish. Our way of thinking how we are going to make him/her have a good life. But then again, there will always be people saying that there are so many poor people who cannot afford to feed themselves who have children every year. I am saddened that we are being compared to that when all we want is for the good of our future child. We always tell everyone that we will have one in God's perfect time but I guess even that simple answer is not enough to sate them any longer. 2015 has not started yet but just like everyone, I would like to welcome it with positive vibes. I know it won't be a perfect year (not like there is ever one) but I hope and pray that this year will be kind to me. I am used to riding the roller coaster of life after all so why is this year going to be any different? Why bother sharing your New Year's Resolutions when you will just be using the same one every year? Why can't we just keep on moving forward, hope and pray for the best and at the same time, work hard to get whatever goal we would like to get in the end? Everybody expects something from their 2015. I just hope that they are not just prepared for the good things but as well as the bad things that might come hand in hand this year. Sorry to burst your bubble but there is no magic. No fairy tale happy endings. Be grateful. Be happy no matter what 2015 has in store for you. 2013 was a year filled with sadness when we lost our dear Lilly but it was also a time for a change when we decided to pursue our passion - food. 2014 was a year or many new beginnings and challenges. As we end this year, we all hope and pray that 2015 be a more beneficial year for all of us, no matter what it brings us. Good or bad, we will be fine. 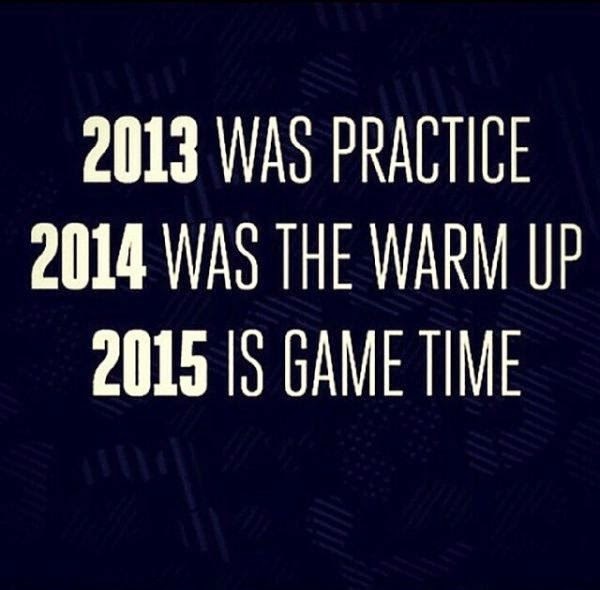 Bring it on, 2015! That's all we can do, be positive and believe that good things do happen as well. Wishing you all the best this 2015 girl!